Visit dtlr.com/careers to enter the DTLR careers official website. Click "www.DTLRJOB.com" in the middle of the page to enter and you will see the first page of the application process. Click the "START HERE" button, and you will get started immediately. You will be required to enter your information on the blank fields, including your name, address, email address, zip code, etc. 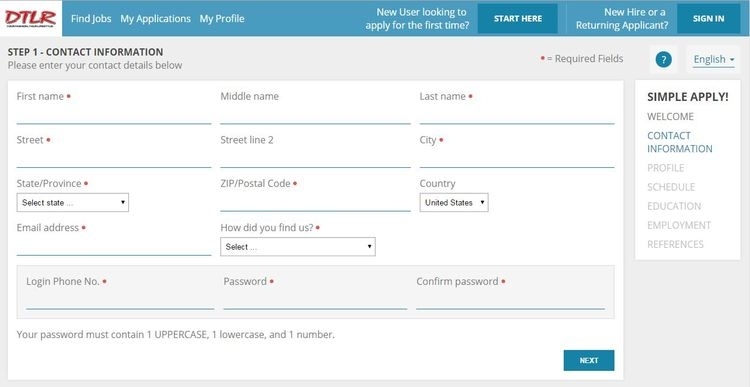 You need to enter your login phone number, and set your password. Click "Next" to enter the following step. There are blank fields for more information about yourself, your age, your lawful eligibility to work in the country and whether or not you own a driver license, etc. All fields with an asterisk must be filled in. Do you prefer to work full time or part time? Which is your first choice? During which period do you prefer to work in a day? Days? Afternoons or nights? You can make your preference clear on this step. This step requires you to tell about your education experience, starting from the highest grade level you have completed. Next, you need to give information accordingly about your high school, then college, and trade school if you have attended any. If this is the first job you have ever applied for, just click “No” and come to next step. Otherwise, you need to give more details, including information about the company you’ve worked at, your earnings, employment dates and other information. When you have finished the former steps, you will see a list of positions provided, together with the locations. Choose the most desired one and click "Apply" button, and relevant materials will pop out for your perusing. This time, you are going to confirm your application by clicking “Apply Now”. This step counts as an “interview” in that a number of job-related questions will be asked to find out if you are eligible for the job. Be patient enough to fill in all the required fields and come to the last step to confirm your application again. Just a click helps you finish the job application. Congratulations! Hope you will get the job soon. Click dtlrjob.com to apply for DTLR jobs online.